October is upon us and change is in the air. 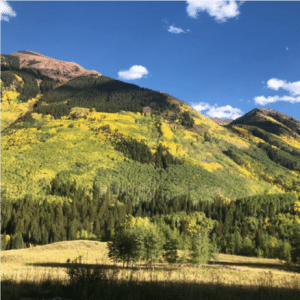 It is officially fall in Colorful Colorado and once the aspens start to transform, we have a short window to get up to the mountains to experience the beauty of the season and see layers of aspens covered in shades of green, gold, orange and red. 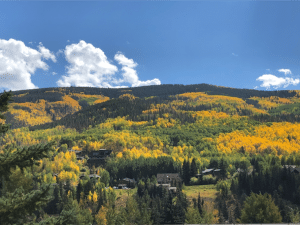 Here’s our list of Four Unforgettable Fall Foliage road trips you can make to check out the golden views and some of our favorite Colorado mountain towns, whether you only have time for a quick day trip, or you are lucky enough to enjoy a relaxing weekend getaway. 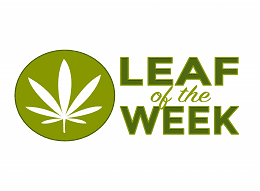 The best times for viewing the changing leaves in Colorado are September and October. Head to the picturesque town of Nederland, just a quick day trip at 17 miles west of Boulder. Nederland is also the base of Eldora Mountain Resort, located just five miles further up the road. If you’re looking to experience the changing foliage and some fresh mountain air, stop by the Barker Reservoir for some quiet meditation or hike the nearby Hessie Trailhead or Fourth of July Trailhead. If you’re keen to visit the town center, expect quaint shops and delicious restaurants. We recommend catching live music at Ned’s and soaking up the patio views, making a pit-stop at the gemstone store, Natures Own, to check out an almost unlimited supply of minerals, and enjoying a hearty dinner at Crosscut Pizzeria and Taphouse or Kathmandu. 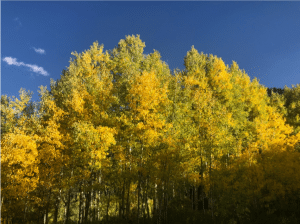 Fall brings dramatic colors of golden aspens against the deep blue Colorado sky in Vail. Located just 100 miles west of Denver, conveniently located on 1-70, Vail is also a great option for a day trip. Plan time for a myriad of adventure activities: mountain biking, waterfall hikes, rafting or golf. Seasons will soon begin to collide in Vail, and it won’t be long before the leaves are blanketed in white. Located just ten miles west of Aspen, Maroon Bells spectacular scenery draws approximately 200,000 people each year. 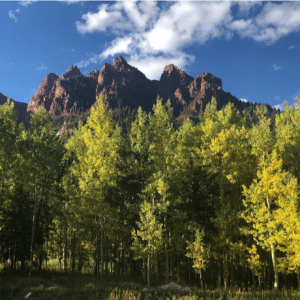 To ensure Maroon Bells and the surrounding Aspen wilderness are protected and respected for years to come, the lands are managed to preserve wildlife habitat and water quality. Enjoy 14,000 peaks, hiking trails, beautiful wildlife like elk, mountain goats, bighorn sheep, salamanders and rainbow trout, plus plenty of gorgeous fall foliage photo ops. If you decide on a hike, we recommend the Crater Lake trail. When heading into Aspen’s downtown for a meal, make sure to try local favorites like Casa Tua or White House Pizza. If you’re looking for something more refreshing and uplifting, don’t miss craft cocktails at Hooch craft cocktail bar or a nightcap, cigar and pool at lively Eric’s Bar. Natural Historic Landmark surrounded by the highest concentration of 13,000’ and 14,000’ peaks in the United States. 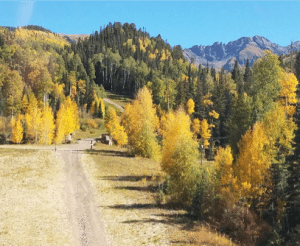 Come to Telluride to soak up the views, changing leaves, and natural mountain air. 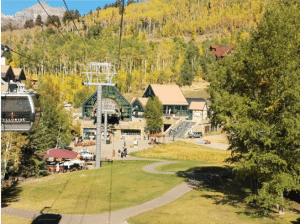 We recommend the Bear Creek Trail up to the waterfall and the Telluride Trail from the top of the gondola down to town. After working up a serious appetite exploring Telluride’s terrain, refuel at Gnarly’s Tacos or the Tomboy Tavern at the Mountain Village. So, remember, wherever your adventures take you this fall, embrace change as the seasons collide. Fall is about releasing the old to make way for the new.